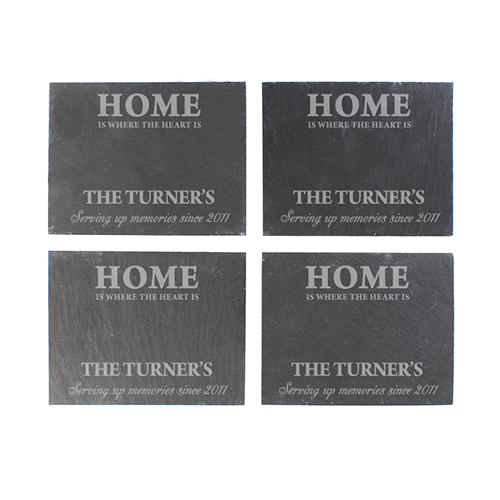 Personalise this Four Pack of Slate Coasters with a surname up to 15 characters and a message up to 30 characters. The wording 'HOME IS WHERE HEART IS' will be fixed text on this item. The Surname will appear in upper case and the word 'The' will be fixed text on this item. Please enter 's if required. Each Coaster has cork pads on the underside to protect the surface they are placed on. Personalise with a surname up to 15 characters and a message up to 30 characters.